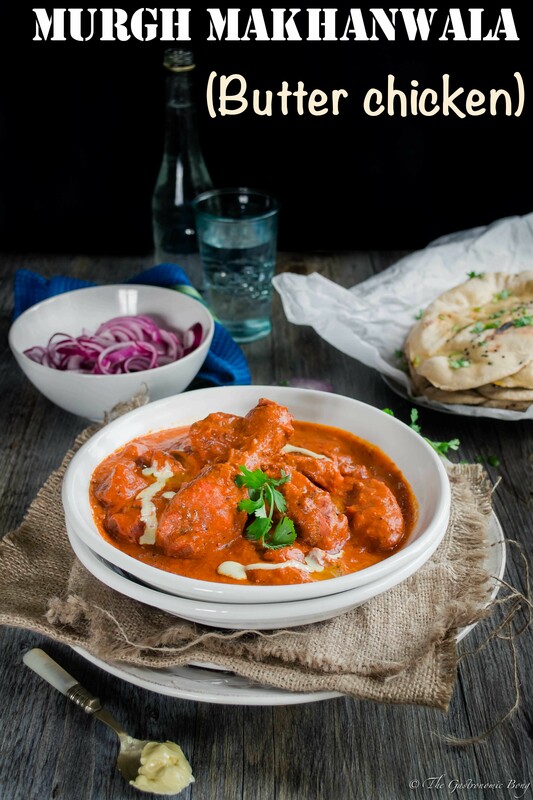 Murgh Makhanwala (Butter Chicken / Murgh Makhani) a very well known North-Indian chicken preparation is a rich, creamy and luscious tomato-based curry cooked with juicy grilled tandoori chicken pieces. It sure is very indulgent and flavourful. Perfect well with butter naan!! OMG! guys this dish is absolutely YUMMMM! Look at it.. Doesn’t it look very inviting?! Really! It is SO SO good! You will never ever MISS restaurant style butter chicken or murgh makhani anymore. 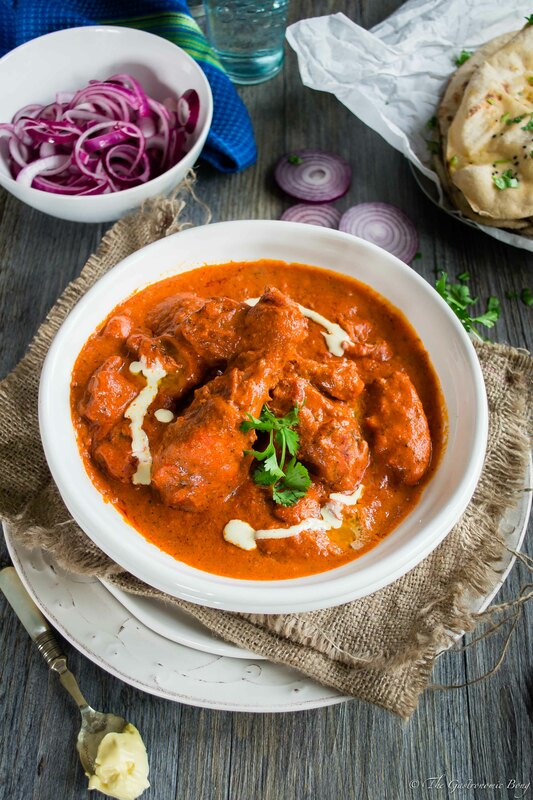 Infact after eating this Butter Chicken you will for sure stop ordering it at any INDIAN restaurants. I PROMISE you won’t miss restaurant style Butter Chicken!! Murgh Makhanwala (Butter Chicken / Murgh Makhani) as the name implies is a buttery rich, mildly spiced tomato based curry. Something I don’t prepare on a regular basis at home coz as you can see this dish is extremely delicious but quite calorific because of the use of all that butter as well as cashew and almonds paste and lots of cream. 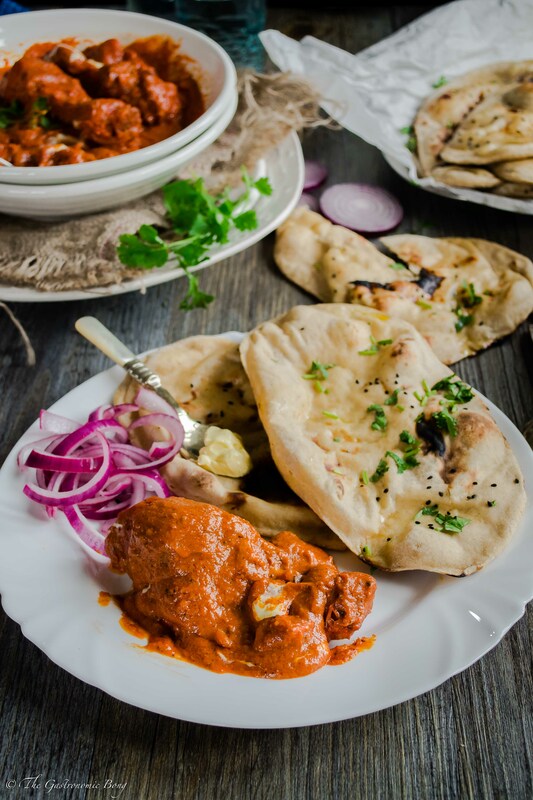 So when ever I make Murgh Makhani or Butter Chicken which is not quite often (though I can eat it every single day :p): I do love to indulge and devour this butter chicken with hot home made naan bread. I can’t even imagine Murgh Makhanwala with out butter naan. As a kid, I still remember this restaurant Grand Central in Mumbai and when ever we used to pass by this restaurant, lingering aroma of butter chicken cooking filled the cold air and wafts through the air to sensory cells in the nose and that used to make our stomach rumble so much that every time with out fail, we end up in the restaurant eating this delicious and creamy Murgh Makhani with butter and garlic naan. It is still one of the best butter chicken I have ever eaten. You all must have known by now that my hubster is gone all gluten free and so did I just to support him. (which gets very difficult sometime). But, this weekend was my guilt free gluten indulging weekend! Man-o-man how I missed my gluten. I completely devoured myself to this super creamy and delicious Butter Chicken with Homemade whole wheat butter naan! Oh man! I Love it! 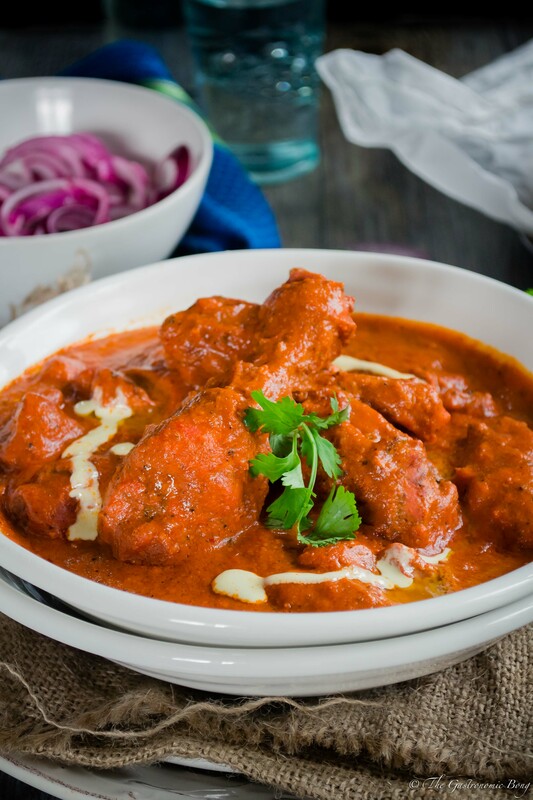 Murgh Makhanwala (Butter Chicken / Murgh Makhani) is extremely easy to make, grilled tandoori chicken is cooked in buttery, creamy and silky smooth, mildly spiced tomato based curry. 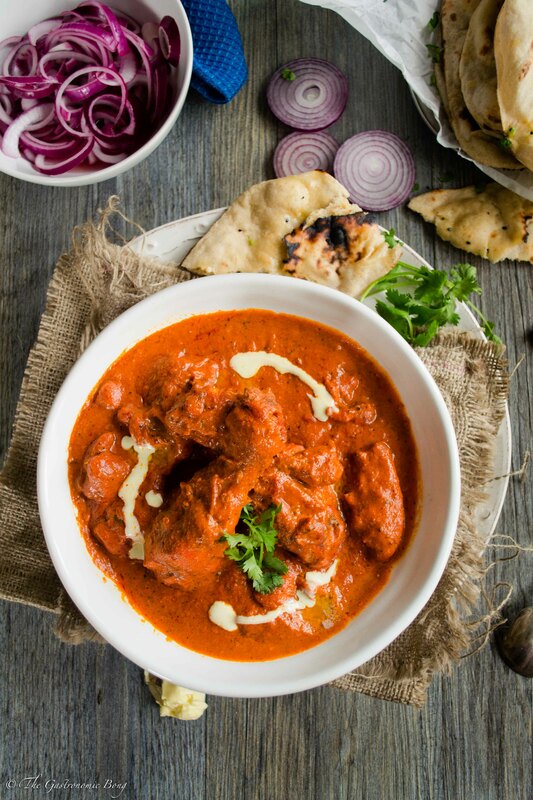 I served this Butter Chicken with “Sirke wale Pyaz” (onions in vinaigrette) a condiment served with north Indian food in every restaurant and with Home made Butter Naan! 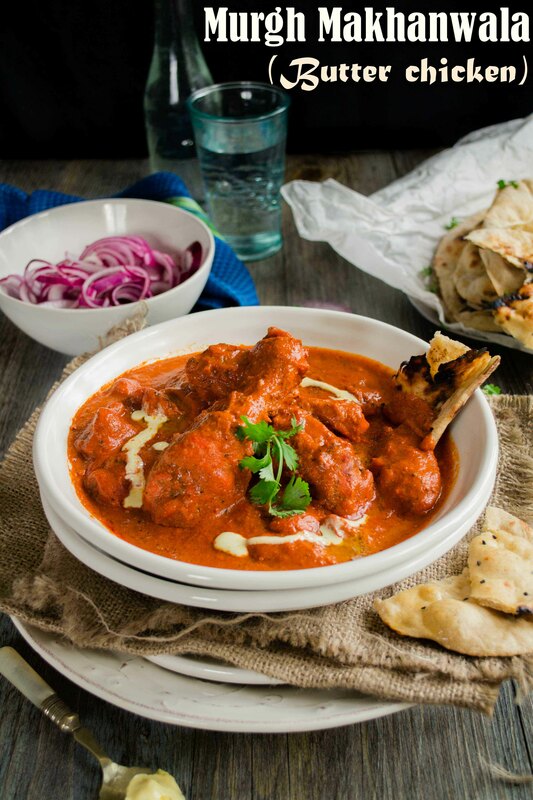 Butter Chicken or Murgh Makhani a very well known North-Indian chicken preparation is a rich, creamy and delicate tomato-based curry cooked with juicy grilled tandoori chicken pieces. It sure is very indulgent and flavourful. Perfect well with butter naan!! In a large bowl mix together yogurt, ginger garlic paste, lemon juice, tandoori masala, Kashmiri red chilli powder and coriander-green chilli paste, oil and salt. Marinate the chicken pieces with this tandoori-yogurt mixture and mix everything well and refrigerate it preferably over night or atleast for 4-5 hours. Now when you are ready, remove the marinated chicken from the fridge. Heat the grill. Now place the chicken pieces onto the rack over a baking tray. Brush or spray with little oil and grill 40 -45 minutes. Turn the chicken pieces once after 25 minutes and cook for another 20-25 minutes or until lightly charred and completely cooked through. Remove from the oven and keep it aside for later use. Heat butter in a thick bottomed pan on medium heat and add the black cardamoms, green cardamoms, cloves and cinnamon and fry for few seconds until its fragrant. Now toss in the chopped tomatoes and the tomato paste along with some salt and fry on medium heat for around 15-20 minutes until the tomatoes are broken down and oil start to separate from the tomatoes. Switch off the flame and let the tomatoes cool down a bit. In a blender or food processor add these cooked tomato sauce along with the cashewnuts, almonds and one cup of warm water and puree to achieve that restaurant style silky smooth sauce. Now in the same pan add the pureed tomato sauce and bring it to a boil. Add more hot water to the sauce to achieve the desired consistency of the sauce (I added another cup of hot water) and simmer for 10 minutes. Now check the seasoning, add salt if required and the sugar/honey and kasoori methi to the sauce and continue simmering the sauce for another 5 minutes. 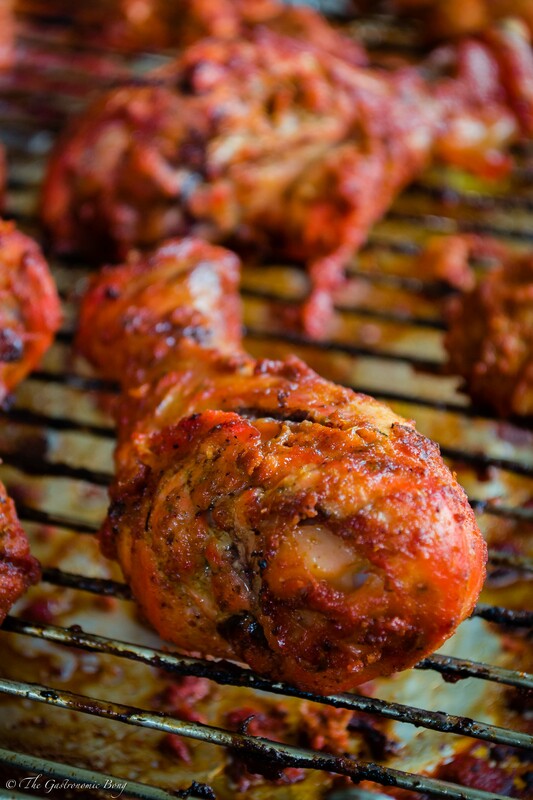 Add the cooked tandoori chicken along with garam masala, stir to combine so that the chicken pieces are well coated with the sauce, cover and cook on low heat for further 10 minutes. Lastly add the cream to the sauce and stir well. Simmer for another 3 minutes. 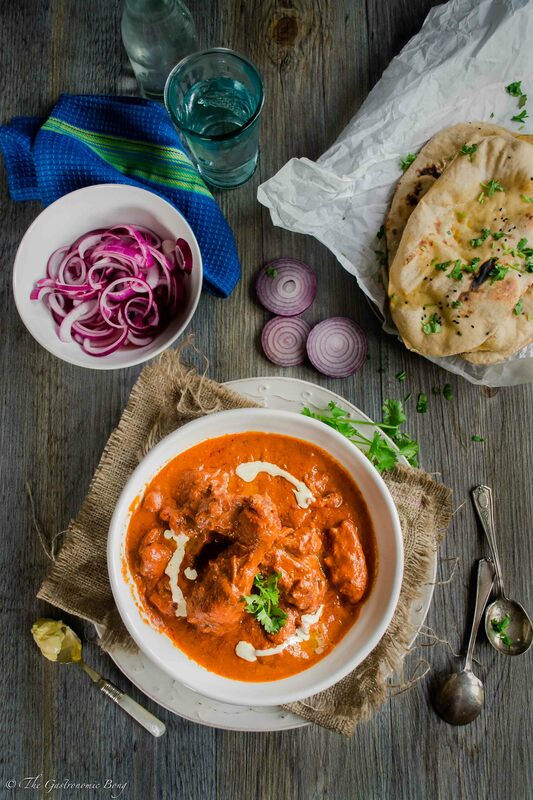 Plate the butter chicken and garnish it with some coriander leaves and drizzle with some cream. Serve it warm with hot naan bread or rice. Wow does that look delicious!! NOM DUDE!! You truly re-created this dish to perfection! I wish I could try it, I must try and modify it a little bit (a dairy free version)… And see if it still works! Oh this chicken looks SO good, Aprita! I love the tomato curry in here. What a fantastic comfort food meal! 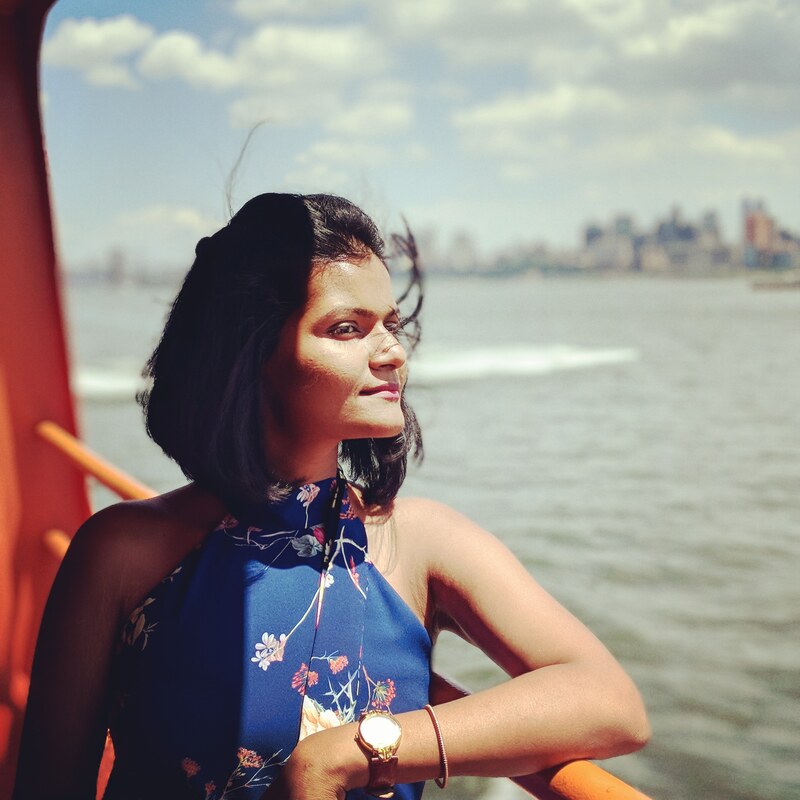 A tomato based curry sounds amazing Arpita, I don’t think I have ever seen this before, sounds delicious! 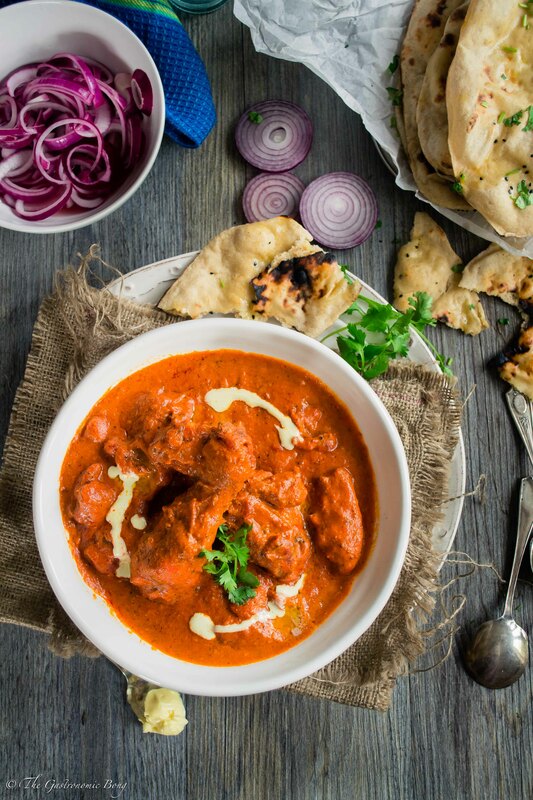 What a perfect butter chicken recipe! I just want to dig in that bowl of gravy. Oh my goodness ! What a mouth watering, creamy and colorful dish ! Usually, to make butter chicken, I buy butter chicken paste. This dish is so popular here, we can buy the paste from pretty much any main food store. I am glad you posted this lovely recipe, I can try this on a Sunday. OMG! I’m so excited by this recipe, it looks incredible! My butter chicken is a much more basic recipe, you’ve gone ALL OUT! LOVE IT! This recipe looks amazing! Love it! Perfect pictures! Butter chicken looks very delicious, Arpita! Love the lush color of the gravy! tempting! This does look really inviting, Arpita! That sauce sounds so flavorful — total comfort food! I’ve made the sauce a few times now, it’s amazing! I leave out the methi leaves because I don’t have any, and have used almond milk instead of cream.. but I honestly don’t think it needs any sort of cream or milk. It’s so creamy with the ground cashews and almonds! Aww… This message really made my day. Thank you so much Juliana. I am so glad that you and your father liked it..